Scroll down to learn how we've helped firms like your organization. We have worked with Meridian for 4 years now. The level of support we receive is like night and day compared to our previous provider. Our account manager took the time to feel out our particular needs and leveraged his experience with hundreds of other law offices to come up with just the right customized solution. I highly recommend Meridian to anyone looking to partner with a top notch business technology firm." 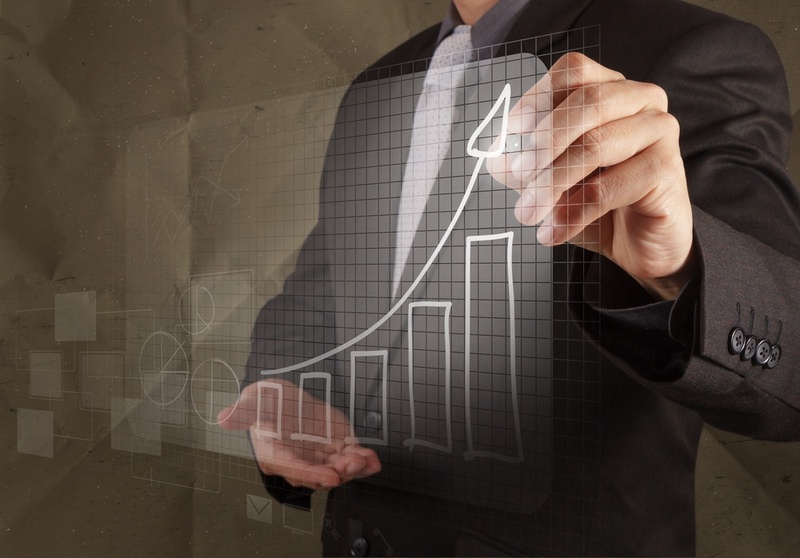 We help Law Firms of all sizes and specialties across the Greater DC Metro Area gain better business outcomes by leveraging enabling technology to make the most of IT investments and realize positive ROI. Meridian has more than 30 years of experience working with the DC metro area’s legal marketplace. Our clients take advantage of best practices gained through a dedicated focus on legal industry-specific services, applications, trends, processes and hardware solutions. The skills and technology expertise shared and deployed within our customer base allow our clients to simply focus on practicing law. The legal industry is known for generating a significant amount of paper, with hard-copy and electronic documents pouring into law firms on a daily basis. In recent years, there's also been significant growth in the need for firms to have a comprehensive technology road map that not only addresses print and document lifecycle management, but also mobility, security, automation and compliance. Handling these items in the most cohesive and efficient manner possible is a key determining factor in a firm’s success and profitability, and this is where Meridian excels. With a team of specialists with areas of expertise covering each type of legal practice, size and area of the law, our brand-neutral solutions are flexible enough to accommodate the challenges of smaller local boutique firms, yet robust enough to integrate quickly with larger international practice environments. Partner with us to leverage our experience working with some of the area's most progressive legal professionals — from 24X7 Help Desk Support to Bates Stamping to Locked Printing and more, Meridian has solutions for the Office to the Copy Center to the Courthouse. 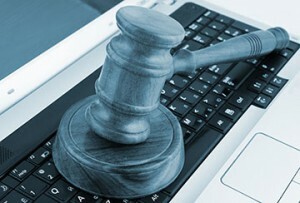 Dispatcher Phoenix Legal is Konica Minolta’s unique solution for legal document handling, streamlining the preparation of case files, automating time-consuming manual processing and increasing productivity for legal service providers. In legal applications, time is money – and you can count on Dispatcher Phoenix Legal to help you serve your clients with speed, security and professional expertise. Ensure legal compliance with secure rules-based audit trail, covering your firm's entire document lifecycle. DP automatically applies Copy Protection features onto documents, preventing illegal copying of sensitive/confidential material. Intelligent redaction ensures any privileged information remains protected. Just set up specific search terms to redact & let Dispatcher Phoenix Legal do the rest to permanently remove information from the document. Use built-in workflows (or customize your own) to fully automate all processes related to file handling, format conversion & intelligent redaction functions to save time & manual effort. You can also apply Bates stamps, convert files to PDF formats & redact or highlight / strikeout files directly from your bizhub MFP control panel with just a few quick taps – customizing operations to fit the needs of any legal document or case file. Use the highly intuitive graphic tool with drag-and-drop functionality to easily automate the best process for each case file based on user-defined rules that cut out repetitive steps as more documents arrive. Trigger workflows at the click of a button, or schedule them to run at a particular date & time. With unique LiveFlo technology, you can watch a real-time view of your workflow as it runs – a time-saving feature to identify bottlenecks & make certain that your inputs, processes & outputs are set correctly. Reduce operating costs, including physical storage, fax, mail, courier, manual indexing & more. With easy-to-use process automation, realize cost-savings while increasing your productivity, as well. Add on a comprehensive IT support contract to access unlimited technical support & expertise without the expense of increasing headcount. Solutions for Casner & Edwards replaced multiple cost-recovery applications, which included routing to iManage and direct integration to their billing system, allowing them to seamlessly account for all printing, copying, faxing and scanning. The firm took advantage of Dispatcher Phoenix Legal’s advanced file capture and conversion capabilities to address the challenge of printing large files and odd-sized documents in the correct order, minimizing administrative document processing tasks. Solution improves client representation, reduces case research and development turnaround time for lawyers, and offers immediate cash savings. Comprehensive network services featuring Managed IT Services, IT Projects, Secure Private Cloud Services, Managed Print and Information Security Services all with 24/7 support. Producing all of that paper for clients can hit the budget hard. We can provide an automated system for cost reduction as well as management and cost recovery solutions that are fully integrated with your network. From there, you get secure workflow management, network faxing, etc., and you can easily charge back to clients. Effective ways to automatically and securely capture, convert, route and share documents throughout your practice. Gain a competitive edge by automating tasks that take up too much time and too many resources, such as Bates stamping, redaction and more. Secure, efficient, leading-edge equipment for copying, scanning, printing, faxing and more. Plus, your firm can leverage our built-in or integrated solutions for seamless bates stamping, cost-accounting, bill-back, in-line professional document finishing and more. RISO digital duplicators can be one of the most cost-effective vehicles for producing legal briefs and other key documents within your firm. Meridian is proud to be the Greater DC Metro area's sole source for new and used RISO devices, as well as authorized RISO maintenance and supplies. You'll our flexible, fair and predictable billing terms. From print to IT and everything in between, we help your firm maximize ROI and budget for necessary investments over time, so you (and your managing partners) can rest easy. 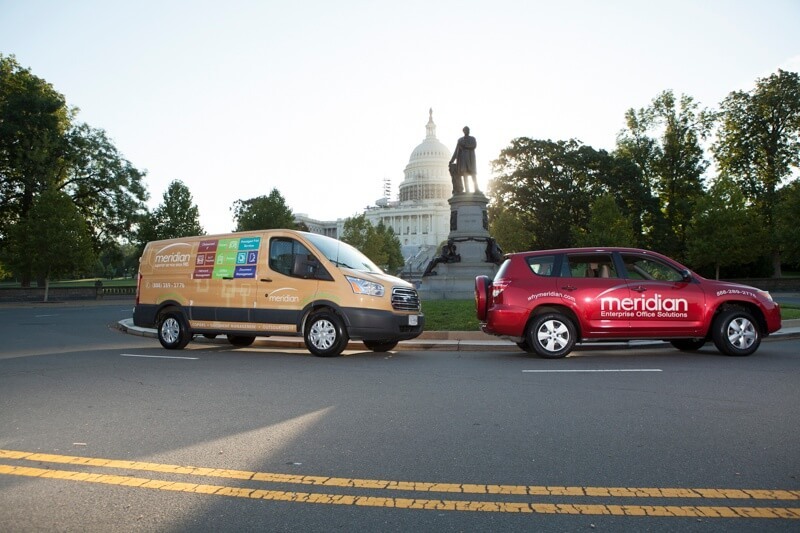 Meridian is a local Washington, DC office equipment, document solutions & IT services provider, headquartered in Alexandria, VA. Since 1985, we've been helping firms throughout the Greater DC community work smarter, get the most out of their technology and achieve their goals. We've got robust teams of over 50 expertly-trained and certified field service support staff geographically distributed throughout DC, Maryland and Northern Virginia. On any given day, you may see them driving all around the beltway (and outside the beltway, too!) in our signature fleet of orange trucks, vans and cars, en-route to provide great customer service. We offer customized support levels that scale up or down to suit your needs and budget, including secure web-enabled chat agents. That means we're always here for you, regardless of whether you want local IT support in DC during business hours, or need technology assistance in the middle of the night while working on a case from a remote location. As a wholly-owned subsidiary of Konica Minolta, we have access to an international network of world-class support providers. You can relax knowing you have a local partner with global presence to centralize and manage all your firm's technology needs, wherever your clients and cases may take you. "Anderson & Quinn, LLC has had a business relationship with Meridian since 2012. We were impressed by our Meridian representative's technical knowledge, tenacious yet easy-going manner, and excellent customer service skills. The prompt follow-up and questions asked in order to determine the best products for our company, and the thoroughly researched responses to our own questions made us feel comfortable in our decision to leave our previous digital office solutions company — with whom we had a business relationship for over a decade. We are extremely happy with our Bizhubs, and with the consistent and prompt service that Meridian provides. Technicians are always very personable and the same core of familiar faces arrive to help us whenever we need service. Furthermore, the technicians always leave their business cards and ask if we are satisfied with the service before they leave. Recently, another attorney joined our firm and brought with him a Bizhub machine. Our representative presented [trade-in] proposals, in addition to analyzing our current usage, taking into account the third copier. His honest analysis showed that we were slightly under-utilizing our two machines...and he arranged for the third machine to be inspected, "brought up to speed," and added to our maintenance agreement at no additional cost. We are extremely happy with Meridian sales and service, and look forward to growing with Meridian over the years." 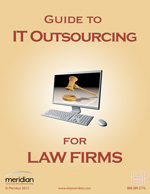 This guide to outsourcing IT services for law firms will help you understand what kind of support structure your firm needs. Plus, get insight on the best path toward creating a secure, innovative AND cost-effective IT strategy — yes, you can have it all!